Remember the carefree days of childhood when you enjoyed simple pleasures like running barefoot in the grass or catching fireflies? This summer, why not try to recreate some of that joy? Summer vacations don’t have to mean standing on long lines at an amusement park or spending a lot of money on a Caribbean getaway. With a little creativity, you and your family can create a season of memories for a cost of next to nothing. Here is a list of 15 fun, free things to do with kids in the summer. Visit the library – From puppet shows to arts and crafts, most libraries offer a selection of free activities during the summer, as well as summer reading programs. Have a movie marathon sleepover – This could be a family event or allow the kids to invite some of their friends. Grab the sleeping bags, make some popcorn, dim the lights, and spend the night watching movies. If you don’t have the movies at home, you can usually borrow movies for free at the library, or ask friends to lend you their favorites. Hold a talent show – Again, this is something that could be limited to family members, or get the whole neighborhood involved for even more fun. Give everyone a day and time, and hold the show in your backyard. Everyone will love sharing their hidden talents! Throw a yard sale – Declutter your home and make some money at the same time. Do some puzzles or make your own – Put together some jigsaw puzzles you already have at home, or look online for free crossword puzzles, word searches, Sudoku, and other puzzles and games. You can also make your own puzzles! Check out Discovery Education’s Puzzlemaker where you can create a word search in a few simple steps. Kids can come up with word search themes, practice spelling, and get really creative. Everyone in the family can make a word search and then share them with each other. Design your own sprinkler – When you can’t get to the pool or beach, sometimes the sprinkler will have to do. With a plastic bottle and some duct tape, it is super easy to make a unique sprinkler that kids will love. Take it a little (ok, maybe a lot) further and build a truly over-the-top sprinkler with PVC pipes. Grow and herb garden – Plant basil, cilantro, chives, oregano, parsley, and other herbs. Children can water them throughout the summer and harvest them for preparing meals. Make your own popsicles – Cool down with these sweet summer treats. Using fruit juice, coconut milk, pudding, yogurt, and other simple ingredients you can easily make your own popsicles. Plus, they are a lot healthier than store-bought. Don’t have a mold or popsicle sticks? Use a small, disposable paper cup and a plastic spoon. Here are some more great popsicle ideas. Hold a car wash for charity – Clean cars, cool off, and raise some money for a good cause. All it takes are some sponges, soap, and a little elbow grease from friends and family. Play board games – Bring out those old board games and fire up some friendly competition. Start a family exercise program – Increase your family’s physical activity with a walk around the park, a friendly game of soccer, a hula hoop contest, a swim in a pool, or a neighborhood bike ride. Try a variety of activities and aim for at least 30 minutes of physical activity, three days a week. Chances are you’ll be having so much fun you’ll want to do more and it will become a routine. Have a water balloon fight – Water + balloons = lots of fun that will keep you cool. Make your own bubbles – With dishwashing soap, water and glycerine, you can make your own bubbles. Visit this page for a variety of different bubble recipes. Need some bubble wands? Pipe cleaners and wire hangers can be shaped into wands, or try making a tri-string wand to create giant bubbles. Set up a lemonade stand – A classic summer favorite. Make some extra money or support a charity. 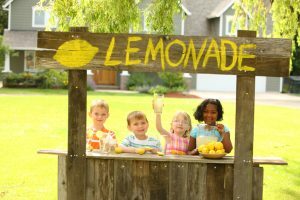 Either way, your budding entrepreneurs will learn a little about business and help provide your neighbors and passersby with some cool refreshment. Make a summer family scrapbook – Throughout the summer, take photos of all your fun family activities, print them out, and put them in a scrapbook. You can also include mementos like shells you found on the beach, pressed flowers, movie tickets, road maps, restaurant menus, and more. Together, as family, you can write detailed descriptions of your activities and mementos, including when they happened and how you felt. Capture your wonderful summer memories forever!